Here is a list of best free Chemistry Simulation Software for Windows. These free Chemistry simulation software let you learn the molecular models of different compounds. You can also learn how chemical reactions take place. The 3D molecular structures of different chemical compounds help to learn concepts of Chemistry easily. One of these free Chemistry simulation freeware shows you different types of chemical reactions, like displacement, double displacement, combustion reactions, etc. These simulations let you learn the phenomena of these chemical reactions and how they differ from one another. 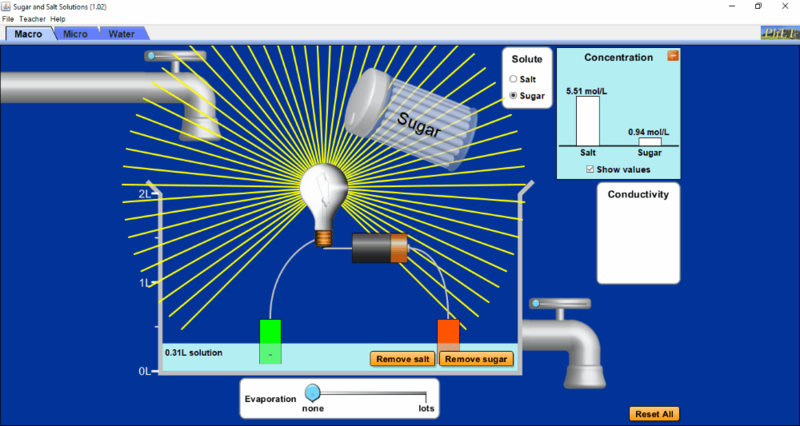 This list of free Chemistry simulator also contains a freeware which lets you learn how the conductivity of water can be altered by adding salt to it. An open electrical circuit is provided to test the conductivity of water. You will also find a virtual Chemistry lab in this list. In this virtual Chemistry lab simulator, you can carry out experiments just like in a real Chemistry laboratory. One of the software lets you form molecular structures of different compounds. It comes with different atoms which you can join to form new compounds. 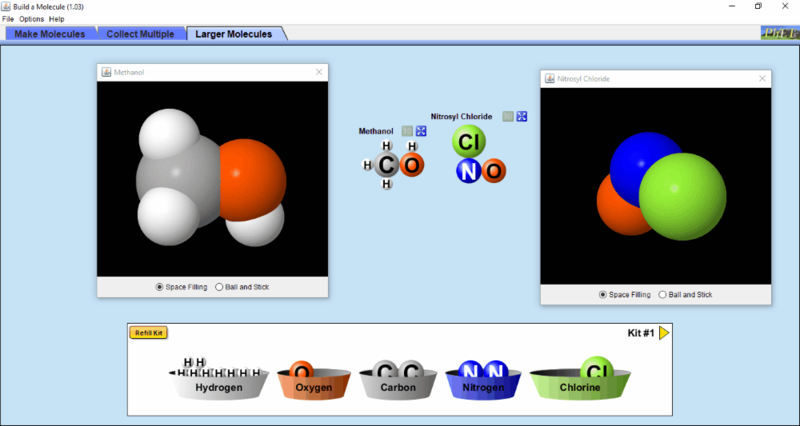 Chem Lab and Build a Molecule are my favorite Chemistry simulation software for Windows. Chem Lab: I find it to be the best software in this list. It lets you perform experiments just like you carry out in a real Chemistry lab. Read the procedure and perform experiments step by step. You can also prepare notes as per your observations. Build a Molecule: Build a Molecule is an interesting Chemistry simulation environment. In this freeware, you can form molecular structure of different compounds. Besides this, every molecular structure is displayed with its name and 3D simulation. Test your knowledge by forming new chemical models and simulate them in 3D. You may also like some of the best free Physics Sandbox Games, Physics Simulation Software, and Medical Manager Software for Windows. Chem Lab is one of the best free Chemistry simulation software in this list. It lets you carry out experiments just like you do in a real Chemistry lab. It has a list of experiments, out of which you can select any experiment to perform. Each experiment is divided into 3 parts: Introduction, Procedure, and Observation. Introduction: This part provides you an overview of the experiment that you are going to perform. All the reactions that will take place in an experiment are written here. Read the complete introduction to know what is going to happen in an experiment. Procedure: This part guides you in step-by-step methods to perform an experiment. All the equipment, like beaker, funnel, etc. and chemicals, such as HCL, Nitric Oxide, etc. are available on the toolbar of this free Chemistry simulator. Read the steps one by one and do as directed. Observations: This is the observatory part of an experiment. Observe your experiment and prepare notes in this section. The best part of the software is that it lets you prepare notes on the basis of experimental observations. Do note that the free version of this software comes with a limited list of experiments. Complete list of experiments is available in its paid version. 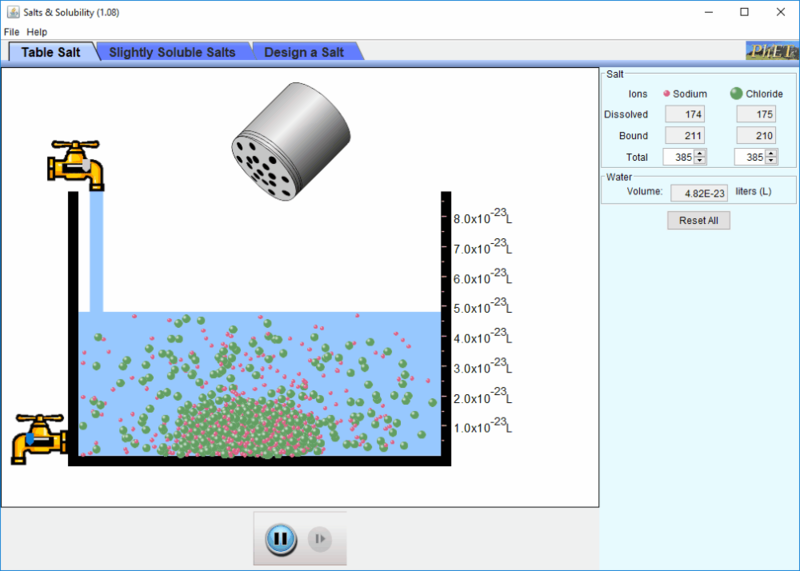 Salts and Solubility is a free Chemistry lab game for Windows. Here, you can study solubility properties of different salts, like Sodium Chloride (common salt), Strontium Phosphate, Mercury (II) Bromide, Silver Arsenate, Copper (I) Iodide, etc. The whole experiment is carried out in a beaker, initially filled with some water. You can empty it or fill more water into it with the help of taps. A salt shaker is available in the software; shake it to pour salt into the water. There is a scale on the right side of the beaker, which lets you know how much water is currently filled in the beaker. 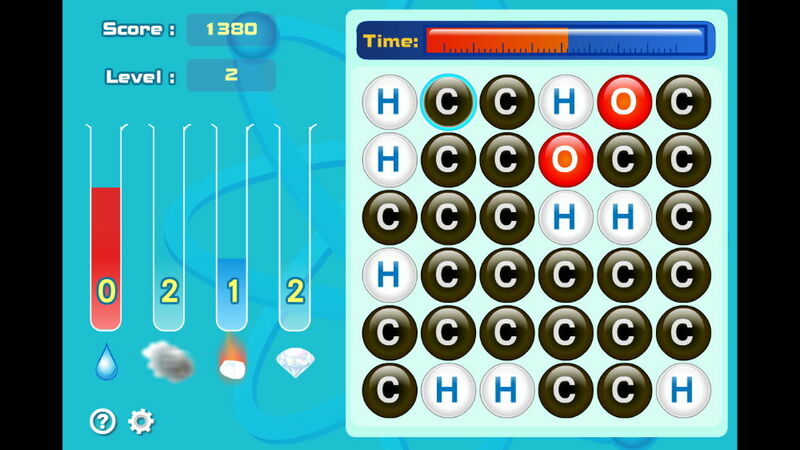 This free Chemistry simulation game also displays the total number of dissolved ions and bonded ions. Both positively and negatively charged ions are displayed with different colors, so you can identify them easily. There is a separate category for slightly soluble salts. In this section, following salts are added: Strontium Phosphate, Silver Bromide, Thallium (I) Sulfide, Copper (I) Iodide, Silver Arsenate, and Mercury (II) Bromide. Common Salt (NaCl) is kept in the section named Table Salt. NOTE: Please ensure that you have Java installed on your system to run this software. Sugar and Salt Solutions is another free Chemistry simulation software in this list. Install it to examine how conductivity of water gets affected by adding some salt or sugar to it. The whole experiment is carried out in a beaker initially filled with some water. You can vary the water level either by pouring more water in it or by emptying it. Two types of solutes are available to study the conductivity of water: Common Salt and Sugar. After pouring some salt into the beaker, you can check the conductivity of water with the help of an open electrical circuit. This electrical circuit comprises a bulb, a battery, and a set of anode and cathode strips. The electrical circuit gets completed when you dip both of its open ends into the water. The brightness of the bulb varies as per the amount of salt dissolved in the water. On mixing more solutes, the concentration of water also increases, which is displayed on the screen in mol/L along with a bar graph. Apart from sugar and common salt (NaCl), some more solutes are also available to add. These include: Sucrose, Calcium Chloride, Sodium Nitrate, etc. Pour these solutes into the water and view the concentration of different atoms of these solutes. With the help of these Chemistry simulations, you can easily learn how an element gets broken down into cations and anions after mixing it in a solvent. The periodic table is also provided in the software in which all metals and non-metals are showed with different colors. It also displays a magnified view of the molecular structure of water, salt, and sugar. This helps you to study how salt and sugar dissolve in water. This free Chemistry simulation software requires Java to run on PC. Build a Molecule is another free Chemistry simulation software in this segment. This chemistry educational freeware helps you form molecular structures of different compounds, like Water, Oxygen, Hydrogen, etc. You will be given some kits containing atoms of different compounds. You have to form molecular structures of the name of the compounds being displayed. Every time you form a molecular structure, the name of that compound is displayed. Besides this, a 3-dimensional view of each molecule is also displayed. Larger Molecules: It is the most fascinating section of this freeware. It comes with more than 5 kits filled with different atoms. Some of these atoms include: Carbon, Boron, Silicon, Hydrogen, Sulphur, Phosphorus, etc. Use these atoms to form as many molecular models you can. Test your knowledge in Chemistry and form new compounds. This free Chemistry simulation software is a very good tool to learn the different molecular structures easily. Install Java before running this software on your PC. All these 5 types of reactions come with 3D molecular models of elements. To understand a reaction, click Play button provided on the interface. Simulation starts as you click Play button. These simulations let you know what actually happens with the molecular structure of elements when they react and how the final product is formed. Apart from this, the molecules section of this freeware displays the molecular structure of some popular elements along with a small introduction. This information contains some chemical and physical properties of elements. This is a good software to learn basics of chemical reactions, but it contains just a few elements. I think that the software could have been made more informative by adding some more elements. 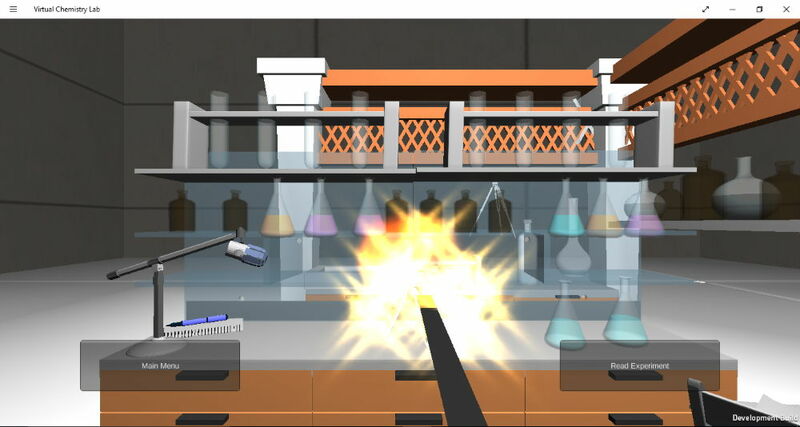 Virtual Chemistry Lab is another free Chemistry simulator for Windows in this list. This Windows 10 app comes with a 3D Chemistry lab view, which lets you perform experiments on your PC. It contains the following Chemistry experiments: Magnesium Ribbon Burning, Preparation of Oxygen Gas, Preparation of Hydrogen Gas, and Preparation of Carbon Dioxide Gas. Each of these 4 experiments is provided with detailed notes, just like in Chemistry Lab Manuals. You can go through the details of an experiment before performing it. A proper guidance is also provided to you while performing the experiments. To perform an experiment, click Perform Experiment button. After that, click above displayed instructions one by one. Comes with limited chemistry experiments. The Alchemist is one of the interesting Chemistry lab games for Windows. It is suitable for all age groups. It comes with a sweet and relaxing background music. The motive of the game is to form molecules of the following chemical compounds: Water, Carbon Dioxide, Methane, and Diamond. Swap the atoms displayed on the screen to form these molecules. This free Chemistry lab game comes with many exciting levels. You have to form the required number of elements within the given time limit in order to proceed to the next levels. Your current score will be displayed on the screen and will get updated with every new element you form. After the completion of a level, your final score will be displayed, which you can share on social media. You can submit your score on its official website too by creating a free account. You can play this game in both compact screen and full-screen modes. NOTE: You should have both Adobe AIR and Adobe Flash Player installed on your PC in order to play this free Chemistry game. 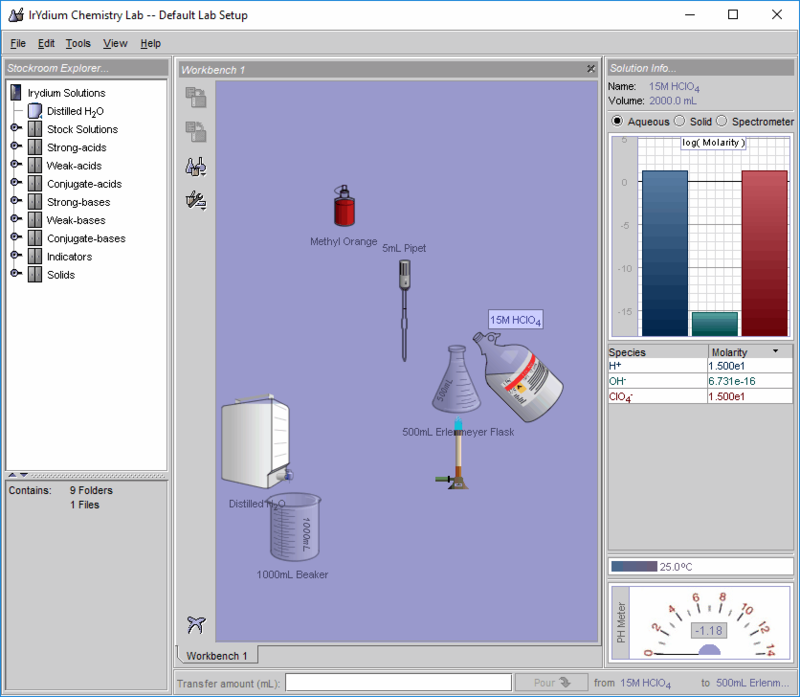 V Lab is a free Chemistry lab simulation software which lets you simulate Chemistry experiments in Windows. It comes with various chemicals, which you can use to prepare solutions. Each of these chemicals is categorized in a list as per their chemical properties. This makes finding a chemical to make a solution easy. For example, if I want a strong base and a conjugate acid for my experiment, I can easily find them in Strong Bases and Conjugate Acids list respectively. Besides this, some popular indicators are also available in the software, which includes: Methyl Orange, Methyl Red, etc. Beakers: Two beakers of different holding capacity (250 mL and 600 mL). Erlenmeyer Flask: Two Erlenmeyer Flasks of capacity 250 mL and 500 mL. Graduated cylinders: Graduated cylinders of capacity 10mL, 25 mL, and 50 mL are provided. Pipets: 5 mL, 10 mL, and 25 mL pipettes are available. Besides this, you will also find a disposable pipet. This software displays the Molarity and present temperature of a substance. Other beneficial equipments include Burner, Weighing scale, etc. You can perform more than one experiments at a time in separate workbenches (worksheets). You can rename each workbench.